The Willows is located in the master-planned city of Irvine, California. 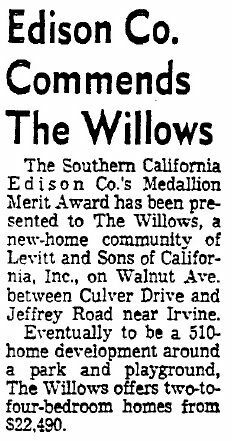 The Willows opened for sales just a few months prior to Irvine's incorporation as a city. 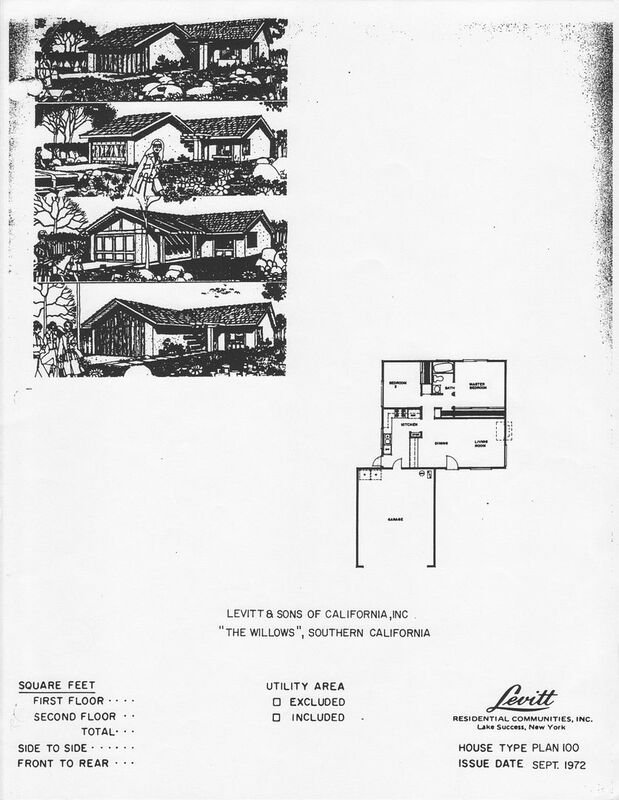 Initial articles on the community reported its location as "near Irvine," referring the planned unit, but unincorporated community being developed by the Irvine Company. 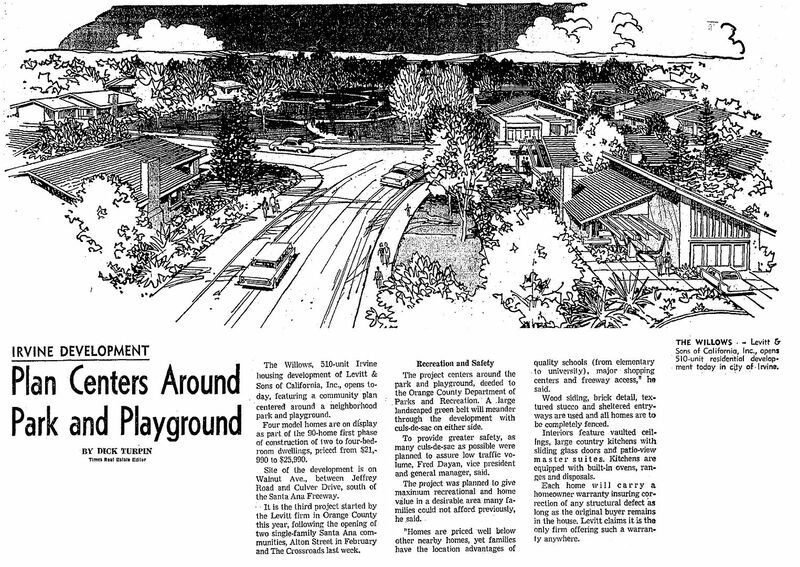 Subsequent advertising described the community's location as "the coming city of Irvine." 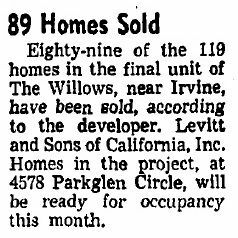 And come Irvine did: on December 28, 1971, Irvine incorporated as an independent municipality within Orange County. 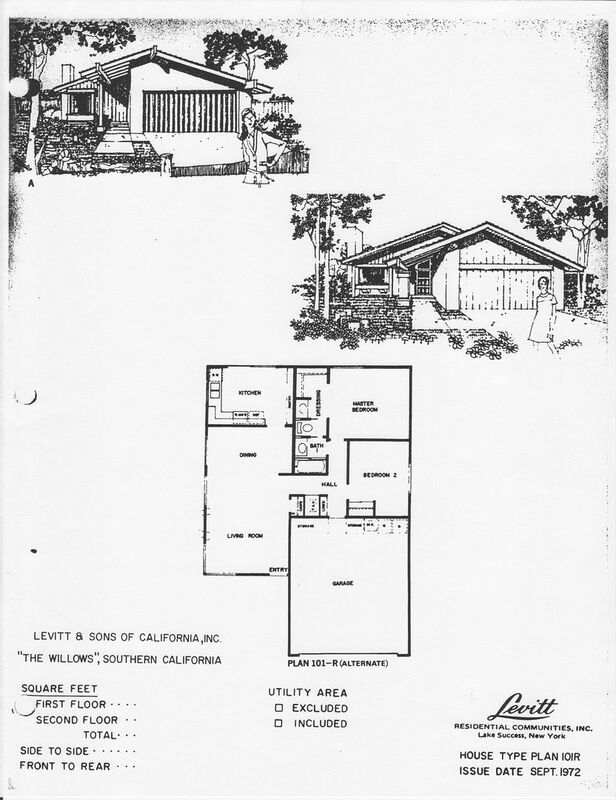 One can certainly draw parallels between The Willows and the Radburn concept. Detached homes on cul-de-sac streets, free of through traffic, with access to green spaces and parks was developed by the City Housing Corporation in the Fair Lawn, N. J. community of Radburn in 1929. Planned as a "city for the motor age," Radburn acknowledged the increasing prevalence of the automobile and sought to design a community where its residents and street traffic could co-exist without the two necessarily interacting with one another. Homes fronted on the continuous greens and parks while the rears of the homes faced the street and provided autmobile access. Over time, Radburn's residents also desired a level of privacy to the extent that the front yards facing the green spaces have become somewhat walled in by shrubbery and other landscaping. The Willows--perhaps unknowingly--can be said to reflect the evolution of Radburn. Homes front onto the street, as is more typical, are situated primarily on cul-de-sac streets, and the culs-de-sac lead to a greenway and park system that is more or less continuous, save for one street crossing that has been designed to minimize traffic speeds. I R V I N E , C A . Location: El Camino Real Village in the City of Irvine in Orange County, Ca. 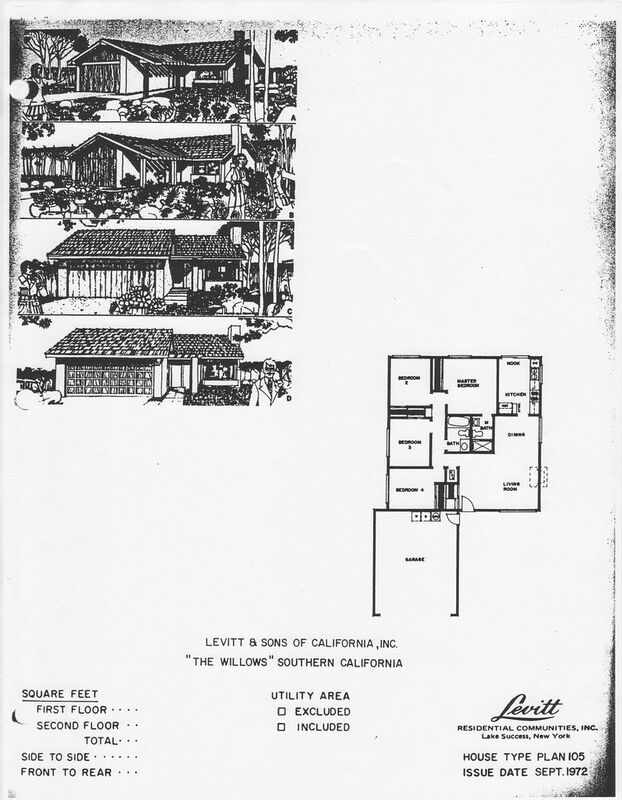 Constructed by Levitt and Sons of California, Inc.
Open for sales September 27, 1970. Street naming: No apparent pattern or theme. Descriptors are Circle for all cul-de-sac streets, Lane or Drive for other streets (except Walnut Avenue frontage road). Official web site for the City of Irvine. Artist's rendering, The Willows Park from Cloverdale Lane at Ranchgrove Drive. Preview all six home designs at The Willows. Concept drawings from the Design Department at Levitt's Lake Success, N. Y. Headquarters are available for inspection. All homes are single-level for easy living and include a two-car garage. Optional fireplace is available in all homes. Rancher. Beamed Entry, 2 Bedrooms, 1 Bath, Living-Dining Room with Optional Fireplace, Kitchen with Serving Counter to Dining area and service doors to side lawn and Garage, Master Bedroom with Wall-wide Closet and access to Bath, Two-car Garage with connections for future Laundry appliances. Rancher. Covered or Beamed Entry, 2 Bedrooms, 1 Bath, Living-Dining Room with Optional Fireplace, Eat-in Kitchen with Wall-wide Pantry and Sliders to back lawn, Master Bedroom with Dressing area and access to Bath with separate wash and commode areas, Interior service door to Garage, Two-car Garage with Storage areas and connections for future Laundry appliances. Rancher. Covered Entry, 3 Bedrooms, 2 Baths, Living-Dining Room with Optional Fireplace, Eat-in Kitchen with Wall-wide Pantry and Sliders to back lawn, Master Bedroom with Master Bath, Interior service door to Garage, Two-car Garage with Storage areas and connections for future Laundry appliances. In lieu of Living Room and Kitchen-Family Room: Living-Dining Room with Optional Fireplace, Eat-in Kitchen with Wall-wide Pantry and Sliders to back lawn. Rancher. Covered Entry or Arched Entry Court, 3 Bedrooms with Den or Bedroom 4, 2 Baths, Living-Family Room with Sliders to back lawn and Optional Fireplace, Exterior service door to Garage, Two-car Garage with Storage area and connections for future Laundry appliances. Rancher. 4 Bedrooms, 2 Baths, Beamed Side Entry, Two-car Garage. Rancher. 4 Bedrooms, 2 Baths, Beamed Entry, Living-Dining Room with Optional Fireplace, Eat-in Kitchen with Sliders to back lawn, Exterior service door to Garage, Two-car Garage with connections for future Laundry appliances. View press releases and news articles for The Willows. 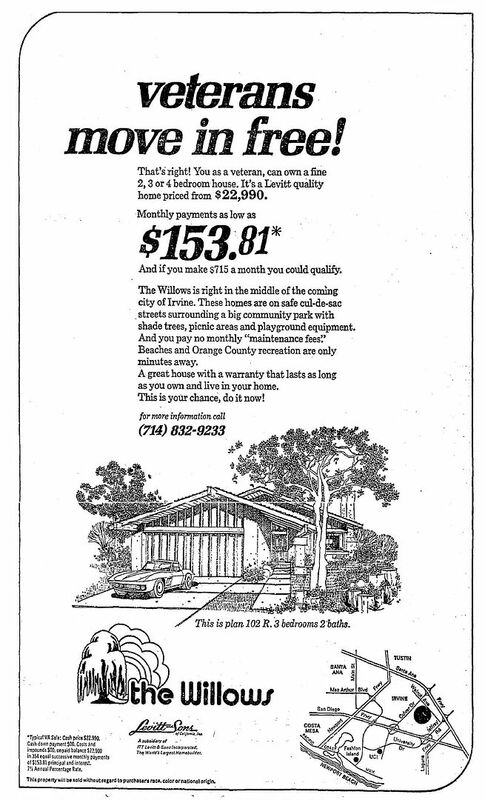 View original newspaper sales advertisements for The Willows. The Willows is designed to minimize interaction between pedestrian and vehicle traffic and to minimize vehicular traffic speeds. Homes are situated on cul-de-sac streets and through streets--Roxbury Drive, Ranchgrove Drive, and Walnut Avenue are designed with diversionary geometry at intersections that physically force traffic to slow down. Homes are situated on cul-de-sac streets with access to a pedestrian greenway system that connects with The Willows Park at the center of the community. 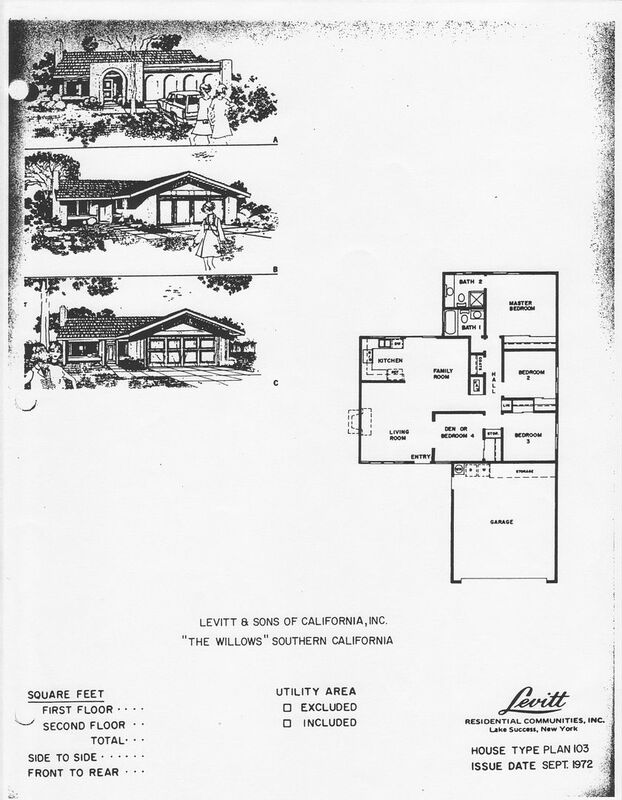 The Willows is Levitt's third single-family community in Orange County. Geared toward first-time and middle-income buyers with young children, the homes were priced lower than those of comparable communities--a market that was often neglected where more profit could be made on a slightly more luxurious home. The homes were generally basic and compact, with two to four bedrooms, but the space was generously and thoughtfully allocated. For example, none of the homes had an entry foyer, the front door instead opening directly into the Living Room, and there were no separate laundry rooms, the washer and dryer instead located in the garage--and furnished by the buyer. The two-car garage provided that extra space for additional storage, hobbies, and crafts better suited for a basement. 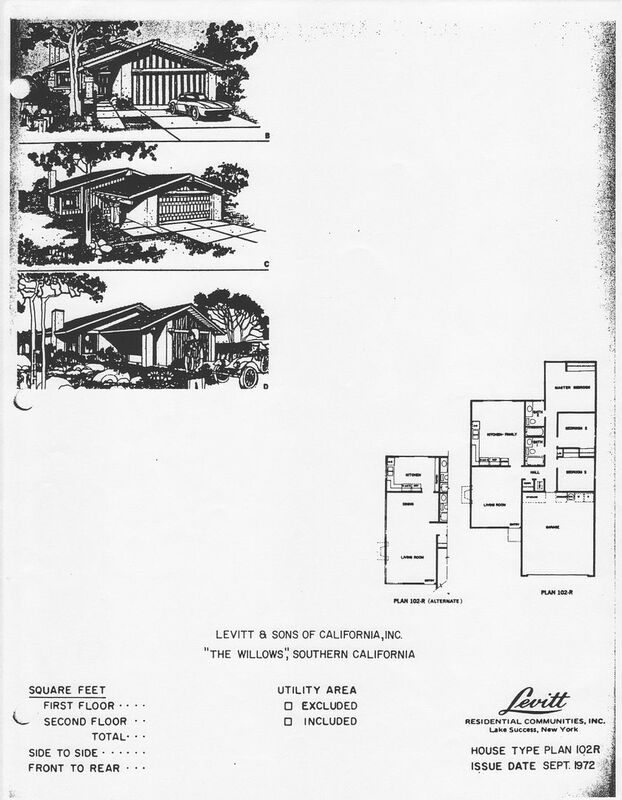 As with the orginal Levittown communities that targeted the middle-income bracket, as the homes rose in value, so to did the desire to stay and simply expand the house when additional space was needed. Because all the models were one story, expansion sometimes meant raising the roof to create a two-story home fronting on the street. However, many expansions took place at the rear of the home, retaining the relative scale of the homes from the street view. The artist's rendering featured above is a perspective view of The Willows Park. The homesites depicted are generally where houses were built, however the exact models on each homesite are not necessarily those that were actually selected by the buyers of those homesites. Page last revised 2 November 2012.